For a fledgling franchise, Green Lantern sure does spend an inordinate amount of time trying to make the extraordinary feel tediously ordinary. When you have a multiple galaxy-spanning storyline, and cast featuring hundreds of bizarre-looking alien marines, why settle for giving audiences lazy earthbound action beats involving helicopter accidents and hordes of extras running in terror through city streets from a big, boring CG monster? In a superhero epic where the hero can traverse the solar system in the blink of an eye, or conjure bizarre weapons out of pure energy, who wants to watch him mope around his apartment in self-doubt or try to win back his boring ex? We've seen these things done too many times already, and done with far more wit and enthusiasm. Sure, on the surface, DC Comics’ emerald-hued icon's mythology comes across as being a mite silly in live-action, but there's no reason a grand space opera couldn't have been adapted from it. Audiences are willing to step into the fantastic if there's an exciting tale to be told that they can emotionally invest themselves in. Imagine if James Cameron's Avatar had only spent 15 minutes on Pandora, and the rest in the military base. Or if Luke Skywalker had ran back to the moisture farm shortly after stepping through Mos Eisley's dingy doors. 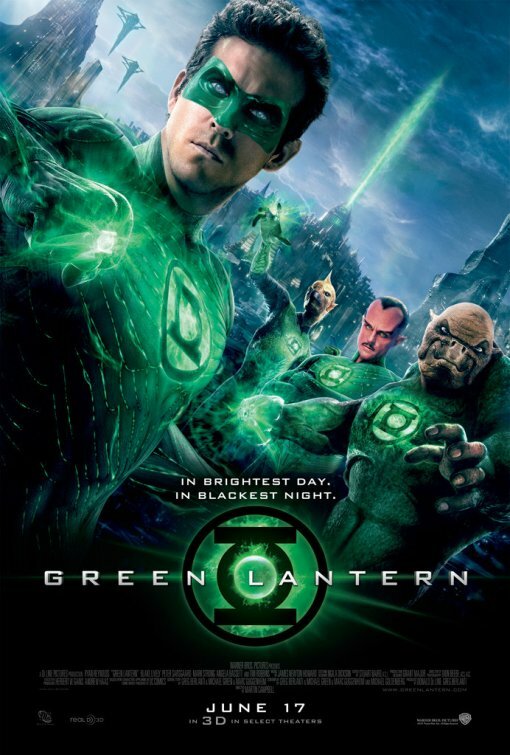 That's Green Lantern in a nutshell; a dull wannabe sci-fi epic with zero confidence in its own appealingly unique creative strengths. Even worse, I'm not exactly sure who this film was made for. It's often too campy and cartoonish - at one point the hero creates a giant Hot Wheels track to save a crashing vehicle - for adults to take very seriously, but also too lethargic and violent to engage young children. Many fans of the comic books will likely take issue with the one-note renderings of their favourite characters, and lack of dynamic space battles, while newcomers to the brand may be put off by the movie's convoluted, sloppily sketched-out mythology and thoroughly unimaginative origin tale structure. 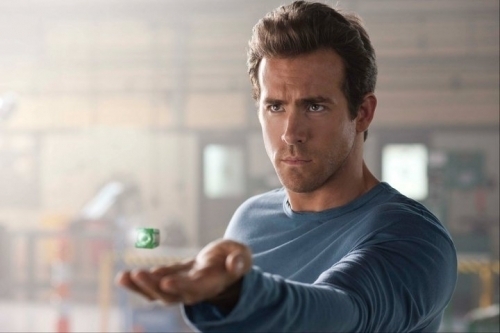 The film follows the adventures of Hal Jordan (Ryan Reynolds), a cocky test pilot in the Maverick mould, who, late one night, is up and whisked away to a fallen space-craft containing a mortally injured extra-terrestrial named Abin Sur (Temuera Morrison). 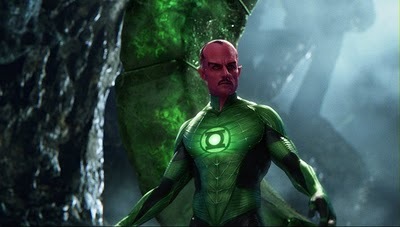 A victim of the life-draining, fear-powered intergalactic entity Parallax, Sur presents the irresponsible human with a magic ring and lantern, which harness the green energy source of will, and inducts him into the Lantern Corps, a team made up of hundreds of intergalactic peacekeepers who patrol the many sectors of the cosmos. Upon inadvertently activating the clunky piece of jewellery in a parking lot brawl, Jordan is zapped to the realm of Oa, where he's given instruction on his uncanny powers - which allow him to make his imagination spring to life via energy-based "constructs" - by the warriors Kilowog (Michael Clarke Duncan), Tomar-Re (Geoffrey Rush) and, most importantly, Sinestro (Mark Strong), the valiant ringleader of the Lantern squad. 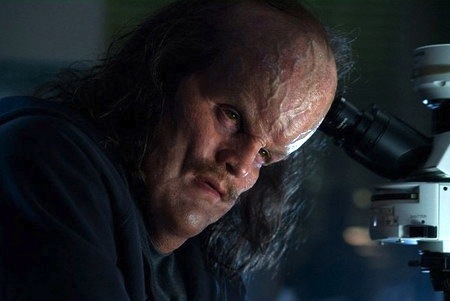 Meanwhile, back on Earth, the body of Sur has been discovered by the U.S. government and handed over to painfully nerdy xenobiologist Hector Hammond (Peter Sarsgaard). During the autopsy procedure, a fragment of Parallax leaks out of the alien's corpse and infects the insecure scientist, causing grotesque physical mutation and infusing him with potent telepathic and telekinetic abilities. As Hector begins to go insane, Hal Jordan struggles to accept his newfound responsibilities and regain the love of Carol Ferris (Blake Lively), a fellow pilot who has long since grown weary of her colleague's reckless attitude. Following an unsuccessful attempt by Sinestro and the Lanterns to capture Parallax, the menacing entity heads towards Earth and it’s up to Hal to step up and save the world. Green Lantern's script, cobbled together by a committee of four writers, accomplishes the paradoxical feat of being both rushed and ponderous. At 105 minutes, the film repeatedly spins its wheels by showing us dreary scenes of Hal sulking or staring at the horizon (this passes for character development), and listening to platitudes from Lively's Carol, yet skips over several fundamental building blocks of good storytelling. We’re supposed to feel something for Hector Hammond, but he isn't introduced until it's time for his transformation. Then, the movie attempts to establish a strong connection between him, Hal and Carol in a couple throwaway lines of dialogue. How are we supposed to care about a relationship that's central to the film when there's little on-screen evidence that it even exists? Much of the picture works that way. We don't see things happen, so much as hear other people talk about them. The Lantern Corps, allegedly, are a near unstoppable intergalactic police force, yet they spend their sadly limited screen-time losing fights and standing around on Oa shining their rings in the air. Everyone endlessly informs Hal what a screw-up he is, but we rarely see him behave in a selfish manner outside of an effective early jet fighter training sequence. In Iron Man, Tony Stark's flaws were laid bare for us to see, and we loved him for them and were eager to watch his metamorphosis. Perhaps Green Lantern's writers were wary of making Hal too unlikable but, by making him so wishy-washy, he's impossible to root for. The film asks us to believe that only Hal is up to the task of tackling Parallax, yet we only see him train with the Corps for five (entertaining) minutes before quitting the group, and having a couple close-call scuffles with Hector. We're expected to accept that growth has occurred without seeing any of it actually transpire. I'd be curious to know how much material wound up on the cutting room floor. There are a number of jarring edits in the film that make nary a lick of sense. Hal's first confrontation with Hector feels like an island unto itself, with no lead in or denouement. It just happens and then we return to business as usual. As well, Hal's trips between Oa and Earth in the latter half of the movie seem to occur almost at random. It's unclear why director Martin Campbell was selected to helm this particular project. He's proven adept at kick-starting more grounded heroes like James Bond (Casino Royale, GoldenEye) and Zorro (The Mask of Zorro), but is hardly the go-to guy when you need to sell the otherworldly. Although he never embarrasses himself, there's no spark of invention in his grand CG superhero action sequences. Lantern's powers, which could be really fun in an inspired Looney Tunes-kinda way, are just delivered matter-of-factly. They don't look terrible, but they also aren't particularly thrilling or dazzling. They're just effects for the sake of being effects. The same could be said for the climactic battle with Parallax, though I’m tempted to give Campbell a pass on that one, as I remain unsold whether any director is capable of making a scene depicting a human-being in combat against an evil space cloud cool. Fantastic Four: Rise of the Silver Surfer couldn't pull it off, and neither can Green Lantern. The cast does what it can with lame material and, for the most part, flounders. As Hal, Reynolds is pleasant enough, and obviously has the masked avenger physique down, but spends too much time looking sheepish to be compelling. He's as edgy as rice pudding, and even his patented ironic observational one-liners feel forced. Lively, competently playing Generic Love Interest, has a few amusing bits, such as during her first face-to-face with Lantern, but is saddled with dialogue no actress should have to utter with a straight face, while Mark Strong acquits himself admirably with what is essentially a non-character (Sinestro, a major staple of the comics, is anything but here). Only Sarsgaard leaves an impression, with a creepy, broad villainous performance that could have been a milestone had Hector Hammond not wound up being completely inconsequential. Everything about the picture feels weighed down by a crushing sense of nervous obligation; to both expanding DC’s cinematic presence and cramming in enough fan-service moments to appease the faithful. However, by following the strict template established by its forebears so joylessly, and short-changing its own potential in fear of offending the average movie-goer, it fails to inspire anything other than apathy. Green Lantern may shine brightly in the comic-book world, but his value in the universe of on-screen superheroes couldn’t be any less murky.